Elisa Alaluusua originates from Finnish Lapland and has been exhibiting internationally since the beginning of 1990s. 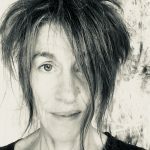 Her first degree was in drawing (1991), since then she has completed two MAs, one in UK (Environmental Art, 1995) and one in Finland (Art Education, 1999), and practice-based PhD at the University of the Arts London (2016) on the topic of Sketchbooks. In 2015 she won the second prize in the prestigious Jerwood Drawing Prize with her video/drawing ‘Unconditional Line’. This article is based on her PhD research ‘Sketchbooks – A Comparative Analysis of the Use of Sketchbooks by Contemporary Artists’ and makes an attempt to get a better understanding of how thinking happens on sketchbook pages and what visual form it might take. The relationship between drawing and thinking is well established and has been eloquently examined by many. This article and its visualizations explore sketchbooks against a premise where drawing is indeed understood to be closely linked to thinking as its manifestation as well as an activity through which thinking happens. A gestural act embodies an act of thought in drawing (Newman 2003: 72) while our bodies produce and store knowledge (Pallasmaa 2009: 13). I understand drawing in its broadest sense as described by Anita Taylor (2010: CD2/02) being something between the two words at the root of ‘drawing’: the old English word ‘dragan’ – which is about dragging something across the surface – and [the Italian] ‘disegno’; with its more complex meaning including the relationship to the internal or conceptual aspects of a work of design (Petherbridge 2010: 18). This article is based on my PhD research Sketchbooks – A Comparative Analysis of the Use of Sketchbooks by Contemporary Artists and makes an attempt to get a better understanding of how thinking happens on sketchbook pages and what visual form it might take. As part of the practice-based PhD research a body of works was created and exhibited as a video installation. The installation consists of videos, or video drawings as I prefer to call them, where contemporary artists’ sketchbook pages are seen on screens and as projections while their words are heard describing their sketchbook practice. Sketchbook narratives are hence presented as a mixture of visual material – videos of drawings and writing and collected material on sketchbook pages – and verbal speech (and subtitles) where similarities and differences are hopefully highlighted between the practices of these sketchbook keepers. The results of the PhD research are now presented in a touring exhibition most recently seen at Drawing Projects UK, a space dedicated to drawing and contemporary art run by Anita Taylor and Gary Sangster, in Trowbridge in February 2017. The installation challenges the single-channel authority as multiple voices and multiple narratives are heard. The exhibition is a perceptual field and offers a phenomenological experience where the visitor has to engage with the work and negotiate around the space in order to start making sense of the material. We can find evidence of sketchbooks as a space for thinking in this exhibition where we can consider sketchbooks as objects, seen on screes, together with the speech we hear as the artists describe their approach. The relationship between thinking and speech is understood to be close yet dynamic and constantly changing where understanding somebody’s words and thoughts is only possible through understanding their motives (Vygotsky 1934/1987: 101, 283). Sketchbooks are often described to reveal the artist’s inner vision (Marks 1972:2) or offer an insight into their mind (Kemp 2008: v). If sketchbooks are revealing (Kirwin 1987, Wilkinson 1972, d’Harnoncourt 1989), then perhaps they offer a particularly good entry point to understanding artists and their practice. When drawing is understood as a way of thinking sketchbooks can be understood as spaces for thinking or even as thinking tools. Through referencing practical examples, I will now present some of that thinking made visible on sketchbook pages. I have chosen to focus on one of the thirteen artists interviewed and included in the original installation. Naomi Shaw is an architect and able to talk about her sketchbook practice in very analytical terms. This may be because she not only practices architecture but also teaches it and encourages her students to keep sketchbooks. 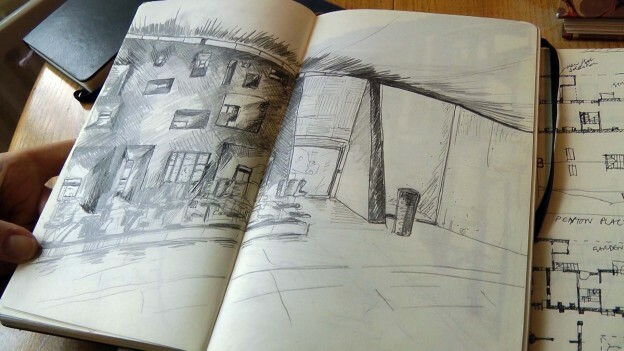 Shaw started her sketchbook practice as a student and has kept her sketchbook collection. She explains that it has taken a long time to start using sketchbooks “that are really useful” for her in the work she is doing. Shaw draws “little snapshots” that are like “thumbnail sketches” as she goes around with her sketchbook. The spaces Shaw is interested in recording have certain qualities that she wants to capture – later on those sketches can trigger things in her mind that are “entirely personal”. Shaw acknowledges these drawings that record what she did in the day as “a map of memories”. Her drawings can be from direct observation, but not necessarily, as Shaw also draws them based on her experiences or indeed using architectural drawings, such as plans, to guide her note making. Sketchbooks are an important way of communication between Shaw and her business partner when they work towards a competition submission, for example. Shaw acknowledges that not everything in her sketchbooks is work related. She also records things such as holidays or dreams in them. It is intentional that Shaw does not keep separate sketchbooks for separate tasks. She thinks it is important to see things together and not to separate her travel drawings from her teaching or design jobs. This way different ways of recording come together allowing one not just to represent, but also to create. Shaw thinks that it is more helpful to have sketchbooks documenting life in chronological order than to separate various aspects of her practice into different books. She explains that she has to force herself to do that, as otherwise she would have “six different sketchbooks on the go at any one time” and she would have “half empty sketchbooks all over the place”. Shaw points out how different types of drawing and recording are combined in her sketchbooks. When she is asked about these different types of potential sketchbooks Shaw is able to identify a number of ways of working in the sketchbooks and reasons behind particular types of notation. According to Shaw, in her sketchbooks there are things to do with her teaching – this includes lesson planning as well as tutorial notes – and also research notes either for students or projects she is working with. There are schemes where she works out [ideas] quite freely, as well as memories and dreams recorded in a free way. She also records spaces she visits, including details and plans for example. Despite the fact that different things mix up in Shaw’s sketchbooks – there are architectural jobs, site surveys, ideas, competitions, dreams, conversation notes, places visited, plans, sections and elevations – there is still overall consistency. During the interview Shaw says that she had not realized before how particular themes come up again and again in each sketchbook. “That”, she says, “is quite fun to see”. Already during her Foundation art studies Shaw was drawn to architectural drawing without herself quite knowing what she was interested in. Her early student sketchbooks have more collaging and photography than the later books, where she has found a way of working that is the most useful for her in the work she does. She says that she often works from both ends of a sketchbook. She starts a new book generally with a new project or perhaps with a piece of research in preparation for a trip. It is not unusual for her to return to her old sketchbooks. During the interview she comes across a sketchbook with a sequence of blank pages left in it with a view of returning to them, and she points out that she does not do that anymore because it is “pointless as you never come back to it”. When looking through her early student sketchbooks and the more recent ones Shaw is able to identify differences in style; the latest sketchbooks have more writing and drawing and don’t seem to have any collaging or photography in them. She is critical about things in her student sketchbooks, finding some “dreadful things” in them but she also points out that they illustrate the difference between recording and representation in art training and practicing as an architect. As Shaw picks up an A5 Moleskine sketchbook she says that she “sort of live[s] out of these ones”. She states that she loves Moleskine because it fits well in her bag, it is waterproof and of good quality paper. She carries her sketchbook with her the whole time and that is why there could be a shopping list amongst dreams, memories, competition time-tables and work related recordings. 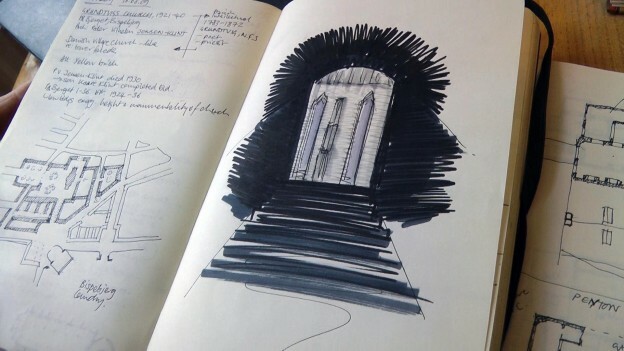 Shaw acknowledges that for her, sketchbooks are a “chronological thing” and that she now enjoys more than ever just filling her sketchbook with “whatever is happening next… whether it’s a visit, a piece of work or an observation or a piece of research”. It could be summed up that Shaw uses her sketchbooks as a tool for representation, creation and communication. As part of the sketchbook research a number of different sketchbook uses were identified; it was outlined that sketchbooks can be understood as multipurpose tools and spaces for recording. They can be seen as books about life; they often are a constant companion and a treasured travelling companion. They reveal thinking on pages; they act as a repository of feelings; they can cover an obsession, be an aid to memory, a storage space, and a communication tool. It was acknowledged that in sketchbooks personal approaches and possibilities are found and also ‘not knowing’ or a ‘need’ can be fostered (Alaluusua 2016: 189). Hearing Shaw describe the usage of her sketchbooks and seeing the pages turned is not only intriguing but also informative. Shaw is able to draw, on paper and in words, a lively picture of her approach with sketchbooks. There is evidence of how the thinking happens on her sketchbook pages as she has drawn a sequence of slightly altered designs or juxtaposed recordings of different sites visited, for example. While reviewing her old sketchbooks she reconnects with memories, old ideas and places recorded. When Shaw speaks about her sketchbook practice she describes particular pages and their content but also explains things that are not obvious when looking at the books. For example, the decision not to keep separate sketchbooks for work related tasks and holidays is a carefully considered choice for her. I believe that it is the sequential nature of sketchbooks that makes them spaces where thinking can be revealed in. It is possible to see how ideas and observations follow one another. Despite the fact that it is not always obvious whether pages were done in the same session or even chronologically, it is possible to get a sense of the motives behind and the methods used by the artist. Listening to the artist speak about their books offers another level of information beyond the marks seen on the pages. The drawings, writing and whatever else is found on the sketchbook pages are visual recordings of thinking demonstrating new connections made and meanings discovered. In their sequential nature, sketchbooks can trace the active processes of the mind that sometimes are very conscious – when trying to solve a problem for example – and at other times are subconscious and recorded in what might look like scribbling or random drawings on the pages. 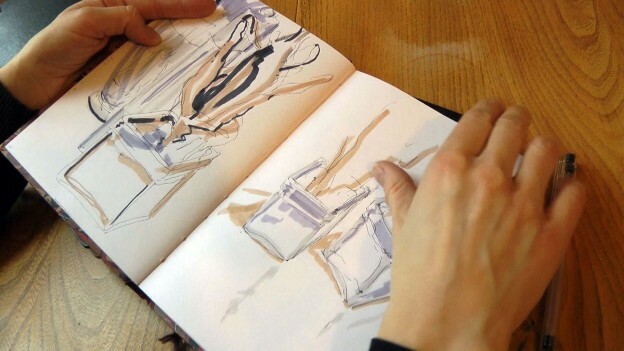 The close relationship between thinking and language is demonstrated in sketchbooks. On the sketchbook pages themselves visual language appears and finds its personalised form typical for the sketchbook keeper. In that language – images, notes written and material collected – is embedded a whole world of thoughts. The artist might be able to articulate them but the thoughts might also be beyond verbalised language. When the artists were interviewed for the research project a number of them pointed out, there and then, that they had just realised something new about their own sketchbooks. Through verbalising their sketchbook practice the artists discovered some aspects of their own sketchbook usage they had not been aware of before, for example a reoccurring theme. For the artist William Kentridge drawing is a medium one can think in. It is a non-verbal thinking process. He explains that you can change charcoal drawing as quickly as you can think. With one wipe of a cloth the image disappears or is smudged and can be rethought. For Kentridge the flexibility of drawing is important. He says that “there is an immediacy of drawing, of thinking in drawing, which is vital for me”. (Maslen & Southern 2011: 200.) Perhaps it is accurate to describe the marks on sketchbook pages as visualisation of thinking revealed in their sequence. 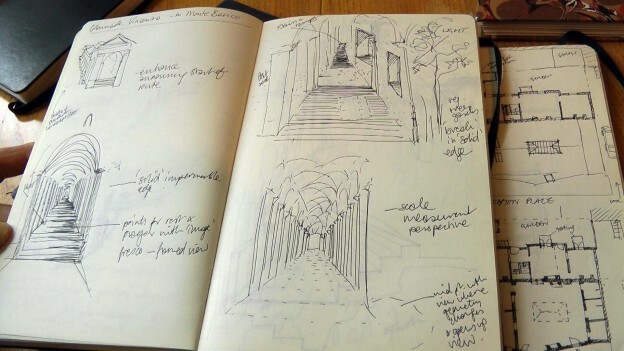 The quick access and easy usage of sketchbooks undoubtedly make them spaces where thoughts can find a visual shape as illustrated in Naomi Shaw’s sketchbooks. It is easier to understand those thoughts when we know about the artist’s motives and those can be revealed through looking carefully at the pages and listening to the narrative of the artist when possible. Alaluusua, E. 2016. Sketchbooks – A Comparative Analysis of the Use of Sketchbooks by Contemporary Artists. Unpublished PhD thesis. University of the Arts London. d’Harnoncourt, A. 1989. Foreword in Reff, T. & Shoemaker, I. H. Paul Cézanne – Two Sketchbooks by Philadelphia Museum of Art. Philadelphia Museum of Art. Pp. 6-7. Kemp, M. 2008. Preface in Leonardo da Vinci Notebooks. Selected by Irma A. Richter; edited with an Introduction and Notes by Thereza Wells. 1st published 1952. 1st published in Oxford World’s Classics 1980. Oxford & New York: Oxford University Press. Pp. v-viii. Maslen, M. & Southern, J. 2011. Drawing Projects: An Exploration of the Language of Drawing. London: Black Dog Publishing Ltd.
Kirwin, L. 1987. Visual Thinking: Sketchbooks from the Archives of American Art. Archives of American Art Journal, Vol. 27, No. 1. Published by: The Smithsonian Institution. Pp. 21-29. Stable URL: http://www.jstor.org/stable/1557653. Also published in Archives of American Art Journal, Vol. 30, No. 1/4, 1990. A Retrospective Selection of Articles. Pp. 155-163. Marks, C. 1972. From The Sketchbooks of the Great Artists. New York: Thomas Y Crowell Company. Newman, A. 2003. Conversation: Avis Newman/Catherine de Zegher in De Zegher, C. & Newman, A. The stage of drawing – gesture and act. New York: The Drawing Centre & Tate Publishing. Pp. 67-82, 165-174, 231-237. Pallasmaa, J. 2009. The Thinking Hand: Existential and Embodied Wisdom in Architecture. Chichester: Wiley. Petherbridge, D. 2010. The Primacy of Drawing. New Haven & London: Yale University Press. Taylor, Anita. 2010. CD. Connecting Lines: Artists Talk About Drawing, Artists’ Lives. ‘Dragan’ on CD2, track 02. National Life Stories in partnership with the British Library. Vygotsky, L.S. (1934); Rieber, R. W. & Carton, A. S. (eds.). 1987. The Collected Works of L.S. Vygotsky, Volume 1: Problems of General Psychology, Including Thinking and Speech. New York: Plenum Press. Wilkinson, G. / Turner, J.M.W. 1972. Turner’s Early Sketchbooks: Drawings in England, Wales and Scotland from 1789-1802. London: Barrie & Jenkins.